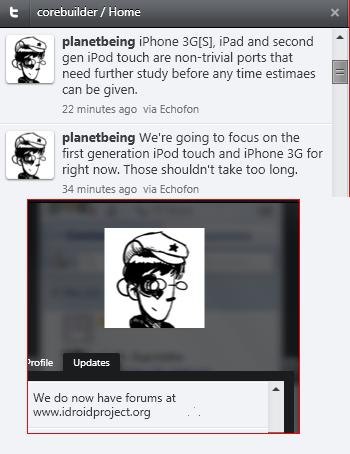 Just few minute back planetbeing announce the update for 3G iPhone & iPod 1st Gen will come in a short time (expecting current week) & iPhone 3Gs & iPod 2nd Gen will take time as they are non-trivial ports and need further study and research. Also inform the twitter community there is a wiki for iDroid is live with the details of research. Good news theiphonewiki has publish the guideline to install Android on iPhone 2G the iPhone owner may like to try how it works on iPhone as Apple will soon stop the update for the iPhone 2G. We already publish the news of success of installing Android on iPhone earlier now time to celebrate the achievement. If possible, use a 32-bit version of Linux. You may have difficulty using the pre-built utilities on 64-bit systems. Backups of any important data on the device. This is alpha-quality software, so you may encounter a problem that requires a full Restore to fix. OH! last thing due to license cant tell you the source of the installer firmware files Google it I bet you will get those..
Keep in mind that UBUNTU 10.04 LTS is coming in 5 day!! you are the one to chose wait for the next release or enjoy it now!